Two Springs and a Box | THERMO Spoken Here! 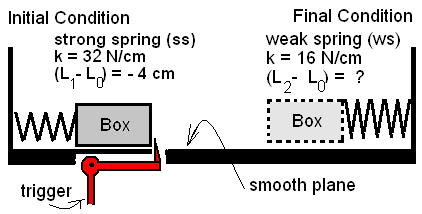 The sketch (left part) shows a Box pressed to move right by a strong spring (ss) compressed 4 centimeters. The Box (at zero velocity) is restrained from moving by the "trigger" mechanism. When the trigger is pulled the Box is caused to slide without friction across the smooth plane. Ultimately (right side of figure) the Box encounters, and is stopped (to zero velocity) by a weaker spring (ws). Calculate the least consequent length (after compression) of the weaker spring at the moment the Box velocity becomes zero. As our system we take both springs and the box. The energy equation applies. Since all forces are internal to the system, the event has no work. There is thermal equilibrium initially. We assume the event happens quickly such that there is no heat. We conclude: the energy change of the system is zero. The system energy is that of the strong spring, weak spring and the Box. The potential energy and kinetic energy of a spring relates to mass, elevation and speed of its center of mass, respectively. The elevations of the center of mass of the springs do not change, hence each ΔPE is zero. We assume both springs are motionless before and after the event. Therefore each spring ΔKE is zero. Finally, the box has zero initial and final speed and the same elevation throughout the event. The Box is a solid; its ΔKE and ΔPE are zero. ΔU of the box can happen if it experience a change of density or temperature; neither happens, hence internal energy change of the Box is zero, ΔU = 0. The internal energy change of an adiabatic spring equals the work it experiences. At the end of the event, the length of the stronger spring equals its free length. At the initiation of the event, the length of the weaker spring equals its free length. Apply these facts to the equation.